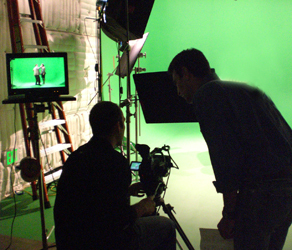 This film shoot was done on a green screen and is for the musical production of "Memphis" produced by the renowned La Jolla Playhouse in San Diego and directed by Christopher Ashley. In the play, the history of Dewey Phillips is revealed. The musical follows the story of this Memphis man who was one of the first white DJs to play black music in the 1950s. The playhouse is performing "Memphis" for their 2008-2009 season from the beginning of August to the end of September. Although my swing partners and I are not in the play itself, we were hired by the playhouse to film their promo segments and advertise for the event regionwide. We all had a lot of fun dancing and learning the various routines. It should be an excellent production.